Remember my goal to eat at home six out of the seven days of the week? Well, we are rocking it! One reason we are doing so well is thanks to some super easy meals that I can prepare and freeze or use shortcut ingredients to throw together fast. 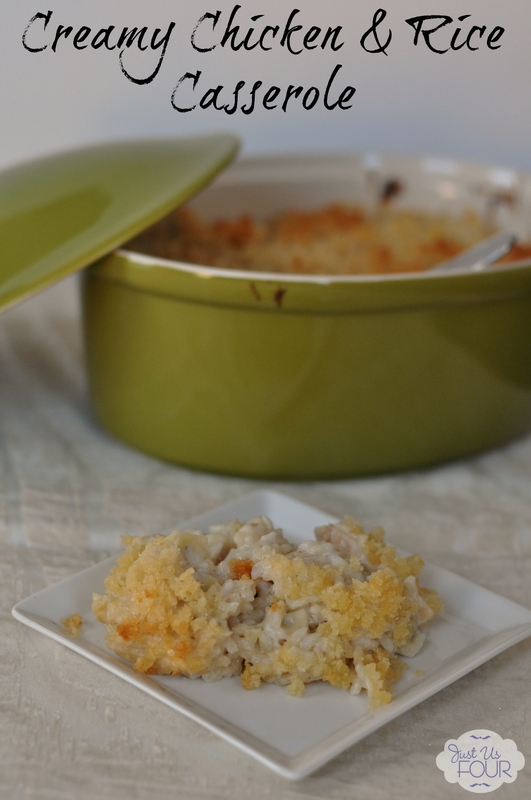 This easy chicken and rice casserole, using Tyson Grilled and Ready chicken breasts, is one of those dishes that I know I can always get to the table even when I am short on time. 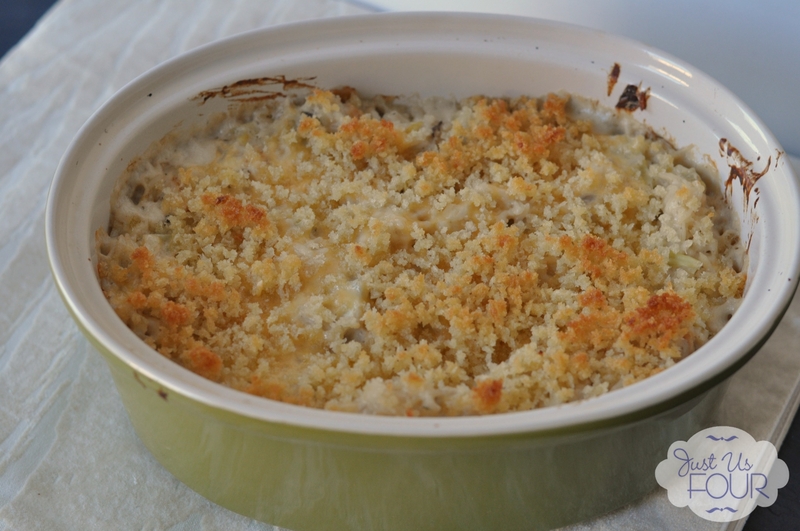 This casserole is so easy and comes together really fast but it is so creamy and delicious that people will think you spent a ton of time and effort to make. I stopped by Walmart to pick up the chicken one evening while my daughter was at gymnastics and put together the casserole for the next night after we got home. 1) Preheat oven to 350 degrees. Spray a 1 quart casserole dish with cooking spray. 2) Bring two cups of water and bouillon to boil. Add rice and remove from heat. Cover and let stand for 5 minutes. 3) In a large bowl, combine chicken, cooked rice, sour cream, cream of mushroom soup, artichoke hearts and 1 1/2 cups of cheese. Stir well to combine. 4) Pour mixture into the casserole dish. Sprinkle remaining 1/2 cup of cheese over the top of the casserole. 5) Combine the panko crumbs with the melted butter. Sprinkle over the top of the casserole. Cover with foil and bake for 20 minutes. Remove the foil and bake for an additional 5 minutes. This casserole is so versatile that you could easily switch up the cheese and use cheddar or change the vegetable to something like peas. I like to double the recipe and split it between two baking dishes. Then, I freeze one for use later and cook one for that evening. Just be sure to thaw it in the refrigerator the night before you want to use the frozen one. What are some of your go to super easy meals? Do you ever try to use products like Grilled and Ready chicken breasts to make meal preparation easier? 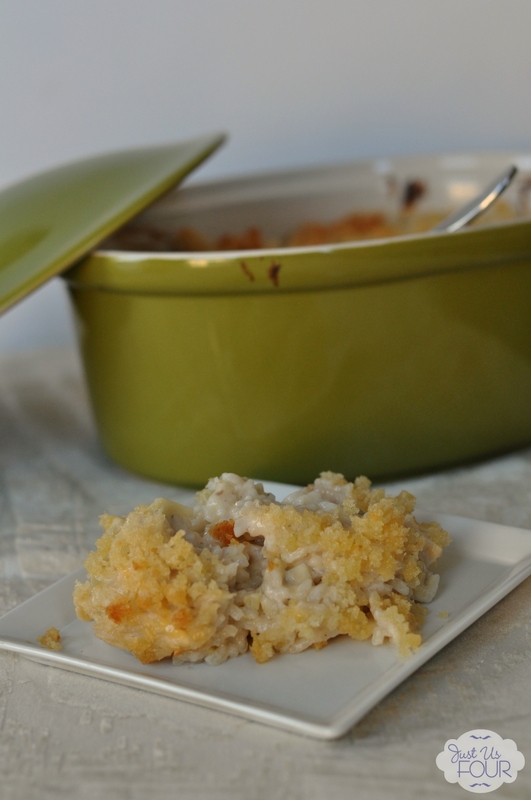 This casserole is so versatile that you could easily switch up the cheese and use cheddar or change the vegetable to something like peas. I like to double the recipe and split it between two baking dishes. Then, I freeze one for use later and cook one for that evening. Just be sure to thaw it in the refrigerator the night before you want to use the frozen one. Preheat oven to 350 degrees. Spray a 1 quart casserole dish with cooking spray. Bring two cups of water and bouillon to boil. Add rice and remove from heat. Cover and let stand for 5 minutes. In a large bowl, combine chicken, cooked rice, sour cream, cream of mushroom soup, artichoke hearts and 1½ cups of cheese. Stir well to combine. Pour mixture into the casserole dish. Sprinkle remaining ½ cup of cheese over the top of the casserole. Combine the panko crumbs with the melted butter. Sprinkle over the top of the casserole. Cover with foil and bake for 20 minutes. Remove the foil and bake for an additional 5 minutes. « It is Party Time – Pinworthy Project Link Party! Hi Shannah – I love how fast and easy this is, plus it sounds delicious! I have not tried the Grilled & Ready Chicken but I absolutely have to! We’re always in sch a rush during the week. Thank you for sharing this! Pinning – have a happy Tuesday! The grilled and ready chicken is great for busy nights. It comes frozen or refrigerated to make meals so easy to put together. I actually bought that exact chicken product the other day for the first time. I found at at 12:00 that my daughter’s cross country banquet was that same evening and I was supposed to bring a hot dish. So in a pinch I used the Grilled & Ready to make a chicken & broccoli alfredo ziti dish and I have to say I was happily surprised at the quality. That looks like a great recipe. I need to buy some of that chicken – that would make life easier! Pinned! This looks like a very easy and tasty recipe. During the winter months I love to try new recipes – I get so tired of making the same food over and over. Thanks! I definitely get tired of making the same things so I am always on the hunt for new recipes or try to create new things. I love this recipe, and the fact that this is on rollback! Less than $6 for cooked chicken is great! I would use it for salads! Wow- that does look easy! This will come in handy when I’m in a hurry, but want to make something good. this looks SO good to me. love casseroles. esp easy ones! I have to give this a try. It looks great. This looks sooo delicious. I love rice. I could eat it breakfast, lunch, and dinner. So this is great for me. Thanks for the recipe! I love casserole. I’ll have to give this one a try. Thanks for sharing . Pinning. Thanks! It is so easy to make and so delicious. Yum I love chicken and rice! One of my favorite things to eat! I love chicken and rice dishes! Debbie Denny recently posted…Tuesday Good Eatin Recipe Hop – Homemade Roasted Tomato Soup ! My family loves any type of chicken casserole. With the addition of rice and veggies, it’s a whole meal. Thanks for sharing. I make a lot of casseroles and will have to give this a try. It looks great! I use Grilled and Ready for just about all my recipes. 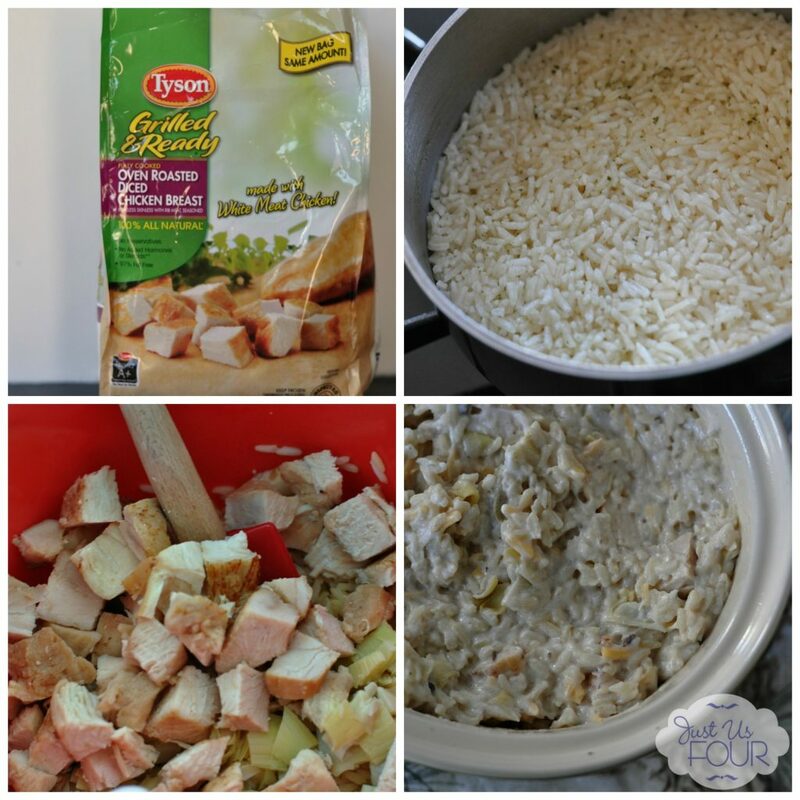 I love chicken and rice, so I am adding this to my list of things to try! The grilled and ready meats make dinner so easy! Love the convenience. That looks delicious! Thanks for sharing it! Thanks! It is a big hit in our home. This is like a chicken rice au gratin or something. It looks like some serious yummy comfort goodness! Thanks so much for sharing this awesome recipe with us! This looks super yummy! I may have to give this a try. I’m trying to make new foods for the family to enjoy and they’re a big lover of chicken so will have to make this. Thanks for the recipe. This looks delicious! Love the ingredients you used! I’m vegan but that certainly makes an easy and quick recipe. I love the idea of making two batches and freezing one for later use. Great tip! Wow, how easy is that?!? And it looks so good too, my kids would love this! 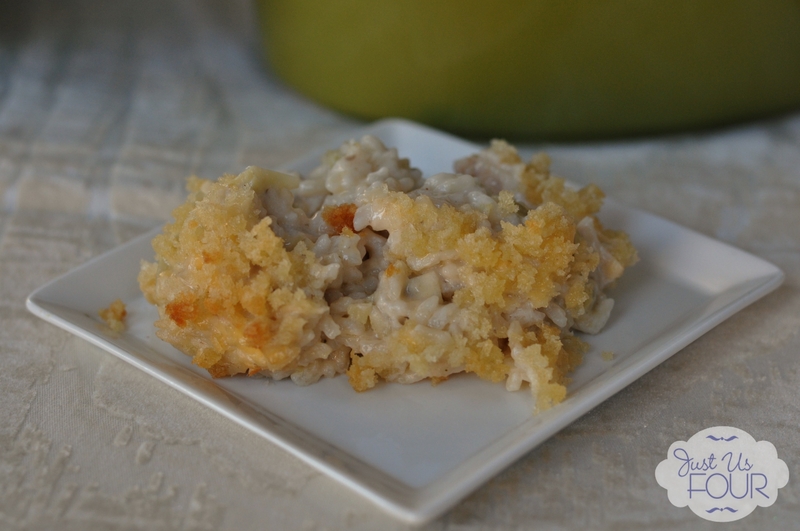 I make a somewhat similar chicken and rice casserole but I never thought to use that kind of chicken in it. Of course I should! This would be a wonderful dish to take to a new mommy. I can make one for her and one for me! Thanks for sharing! That is a fantastic idea! I have a friend who is pregnant so I just may do that. Take a hot one for dinner and a second frozen one for later. We had “13 spice chicken”last night and originally I was going to make soup for dinner. Perhaps I will make this! We have everything else in the list. Good for you guys on eating out less! I need someone to come here and kick our butts into shape. Oooh 13 spice chicken sounds delicious! I love chicken and rice. This looks so easy to make too!! This recipe looks so easy and so delicious. What a great combination! I love rice dishes – add cheese and I’m in heaven. Christy recently posted…With 6 Kids, You Never Know What Life Will Bring. That’s NOT Always Bad!